It wasn't that long ago that storing images meant a shoebox under your bed, and sorting/filing them meant a choice between sticky pages or sticky photo corners in a paper album. Casual photography has changed the way we treat our images, but one thing hasn't changed: we still need to be able to find the shot we want. MAGIX Photo Manager MX Deluxe includes tools to do just that. Photo Manager offers you many options for nondestructive image editing, plus an option for launching Photo Designer, MAGIX's free photo editing tool. Unlike many image management software, notably free Picasa, and Serif's Photo Organizer (which comes bundled with PhotoPlus X5) Magix Photo Manager MX Deluxe has you create the photo database yourself. If you have gigabytes of images, this may seem a little daunting, but you simply navigate to the folders you want to add to Photo Manager MX and you have far greater control of which images you add and when you do it. Unfortunately, the UI in Photo Manager MX is so confusing it's really difficult to see what you've added and how to find things. Ironically if your pictures are a mess on your hard drive, they're going to be a mess in Photo Manager MX. Not a good start to helping me get more organized. Once you're ready to start organizing, you can create as many categories within Photo Manager MX as you need, and nest them as deep as you dare to go and assign icons to each of your categories. This is very similar in function to PicaJet FX ($60 photo organization and optimization software), although I like that in PicaJet FX you can pick a photo to use as your icon and don't have to browse to its location as you do with Photo Manager MX. After all, shouldn't Photo Manager know where the image is better than I do? The other thing I disliked with Photo Manager is that there seems to be no indication when you add an image to a category, other than going back and looking. Plus it is much more labor-intensive, difficult, and confusing than PicaJet FX. Magix Photo Manager MX does have facial recognition built in. On my test photos, it was so slow it would have actually been more effective to look every individual thumbnail myself. However, it did pick out most of the shots where eyes faced the camera. If you don't want to use Picasa's very effective facial recognition because of Google's Privacy Policies (Picasa is Google's free image management software), Photo Manager may be a good option. Also, Photo Manager MX includes basic image correction tools, which are as good as you would expect from a program not billed as an image editor. Although Photo Manager MX's "automatic" red eye detection didn't seem to do anything much to correct my test image, the manual version worked very well once I got the hang of it. I also liked Photo Manager MX's frequent and easy links to MAGIX Photo Designer, a free photo editing tool that's not as fully-equipped as Adobe Photoshop, but certainly does the trick if you need to clean up or adjust an image more than Photo Manager can handle. There's a free version of Photo Manager, but the tool is far more basic (it doesn't include detailed search or sorting for example, or image editing) than Photo Manager MX Deluxe. And the Deluxe version includes a plethora of features that could be very exciting if you're on the lookout for them. 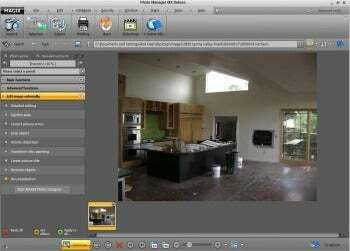 For example, it can try to correct the curved lines and converging verticals in your architectural shots, record commentary and sound and add it to your images, create travel route animation, and put together video slideshows. Without these special tools, MagixPhoto Manager MX Deluxe is much like a very nice-looking shoe box. It's hard to get a handle on organizing your images, and you are going to have to put a lot of time and effort in at the front end to create your database. Although you may feel a little out of control of your images at times, Photo Manager MX Deluxe has some cool add-ons that, if they're something your looking for, could make it worth paying $60. If you're looking for an easy organizer, try $60 PicaJet FX instead. Organize, edit, and present your image collection with nondestructive Photo Manager MX Deluxe from MAGIX.